Die cutting is the process of cutting materials using a tool built specifically for flatbed or rotary die cutting presses. Dies are metal blocks or cylinders custom built with blades to perform precision cuts. 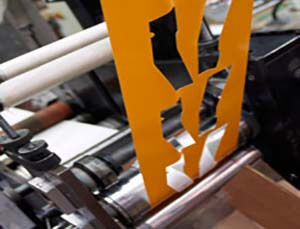 Flatbed die cutting is a great way to cut through extremely thick material or material supplied in sheeted form. Rotary die cutting is a much higher output and much more efficient process to cut materials supplied in roll form. 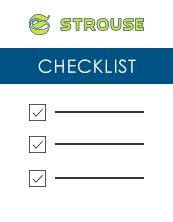 Strouse has both flatbed and rotary die cutting capabilities. Rotary die cutting is a process in which a roll of material is fed through a press containing a die station. At this die station is a rotating cylinder blade that cuts the material. The die rotates in conjunction with the speed of the material feed through the press to ensure the blades make the exact length cuts every time. Our presses are equipped with servo motors that achieve continuous registration of material to ensure we maintain a tight tolerance precision die cutting process. We like to compare die cutting to baking cookies. Flatbed die cutting is like using a cookie cutter to cut shapes from material. Rotary die cutting is like combining your cookie cutter with your rolling pin so that you can create multiple and continuous shapes in an efficient manner. Over the last 15 years, Strouse has manufactured over 2.6 billion adhesive die cut parts that are crucial to Lexmark’s Inkjet cartridge assembly process. These parts are 100% inspected on press in real-time using our sophisticated video inspection technology. We've had a 100% on-time delivery rate with 99.99998% quality approval. If this is the type of precision die cutting work you expect from your adhesive converter contact us today!